When you first start counting your macros it’s important to remember that it’s just like starting anything new and different. It takes time, effort and practice before it feels natural. Think about learning to play basketball. At first it takes all your energy just to dribble the ball but the more you practice dribbling the more it becomes second nature. Now it’s easier to focus on other aspects of the game. Getting through that initial learning curve can feel like the hardest part. Soon enough, you’ll find what works best for you and it will become easier and less energy consuming. Counting your macros all starts with knowing what is in your food, which comes from being able to read and understand nutrition labels. Serving Size: You’ll notice that the serving size is given as a cup measurement and as weight. We strongly encourage measuring by weight. Total Fat: This includes all fat types (saturated, unsaturated and trans fats) and this is the number you should track. Total Carbohydrate: This includes sugars, sugar alcohols (if there are any) and “Dietary Fiber” if it’s present. Protein: This is the number to track for protein. No matter who you are or how long you have been counting macros, there are tools, resources and best practices that will ultimately contribute to your success. Most people use an app to track their macros, which make sense since we have our phones with us all the time.There are many different apps to choose from. Our members love MyFitnessPal (MFP) and My Macros+ (MM+). 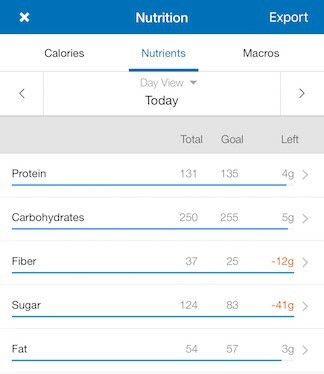 MFP tends to be the most popular, so we’re going to show you some MFP app basics. Many will translate into whatever app you decide to go with. Scan the code: You can use MFP to scan the barcode of your food into your diary. This will allow you to pull up the nutrition information quickly and log it into your day. Always check this against the label... it is often not accurate! Select smart: There are a ton of different entries for a food when a barcode is unavailable. Simply use the manual search bar. Get official: MFP puts green checkmarks next to “verified” entries that have the full, correct nutritional information listed. This doesn’t mean that entries without check marks are inaccurate, verified foods just make complete entries easier to find. We also recommend using the USDA database whenever possible (especially with whole, fresh foods that have no labels!) for accuracy and consistency. We’ll talk about this a little bit more in the Raw, Cooked or Frozen section! Check your work: Double check any entries you use for accuracy. There are a lot of entries in the food database and they are often wrong or incomplete. Use an outside source: If you are unsure if an entry is accurate, double check with an outside source like CalorieKing or the USDA website. 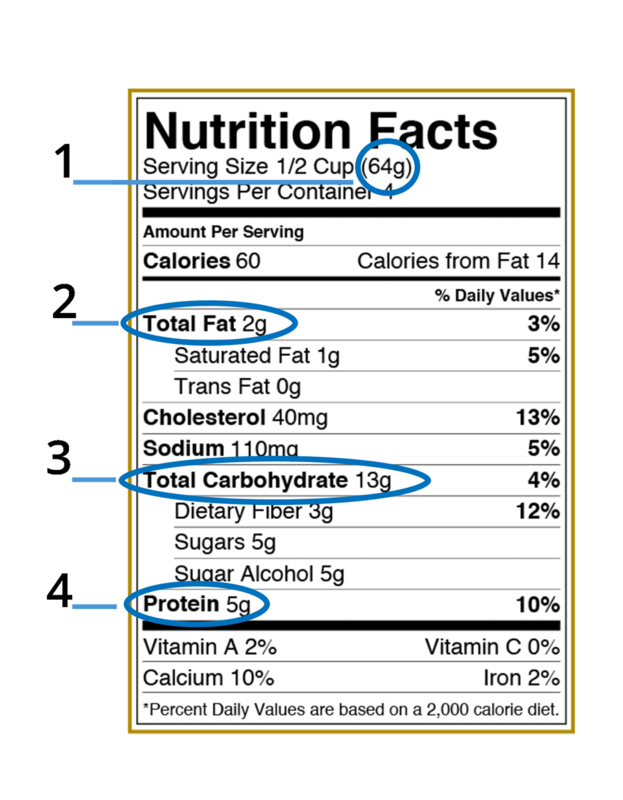 When scanning entries into MyFitnessPal, make sure the entry matches the nutrition listed on the package since packaging changes occasionally. Also verify the serving size, because those can definitely be sneaky. Pay special attention to the fiber amount in food entries because many of them are left blank. You could be getting more fiber than you think! You can rename your meals in MFP! Change them from "Breakfast," "Lunch," and "Dinner" to fit your eating time and style. How about ‘Meal 1, Meal 2’...or even ‘pre-workout, post-workout, sweet treat’. Have fun with it! See the big picture: Along the top of your "Diary" page, you can "Customize your Dashboard". Hit the 3 grey dots in the top right corner (if you have Premium). Click "Macronutrient Focused" to display your remaining Carbs, Fats, Proteins and Calories for the day. Keep tabs on how you’re doing: Scroll to the bottom left of your diary page and select "Nutrition." A bar graph representation of how manymacros you've eaten and how many you have left will display. This visual is super helpful! Want to nerd out on MFP even more? We have a ton of tutorials on our Blog and our TeamWAG YouTube Channel that can show you how to create recipes, foods, meals and log certain tricky things! How do you know what foods to put into your MFP diary once it’s set and ready to go? Let me introduce you to your new best friend...the food scale. To be most accurate, create the most consistency and have the fastest progress, everything you eat must be weighed so you have approximate numbers to track . We recommend using the weight of food over measuring cups and spoons. It’s more accurate. There is much less peanut butter in the tablespoon on the right. 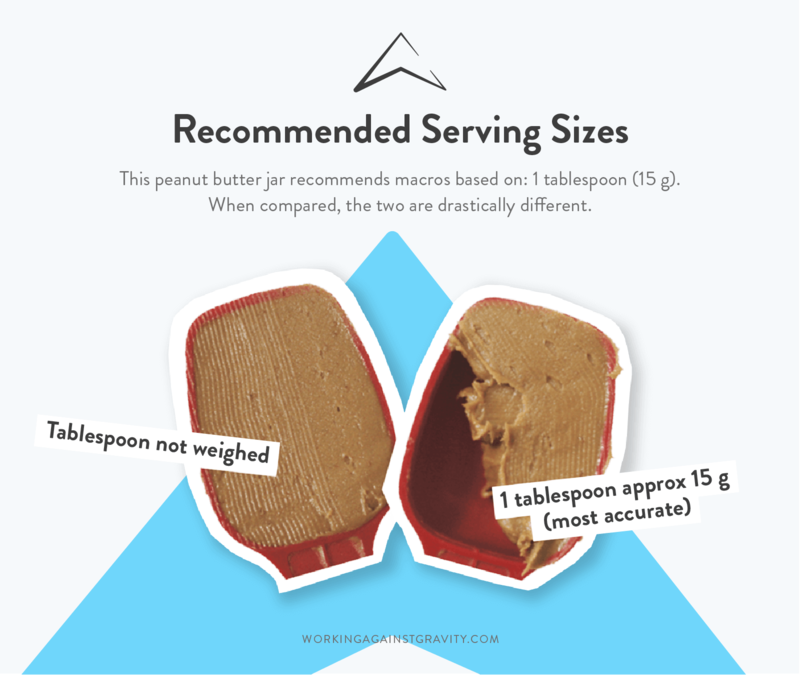 If you use a full tablespoon you’re probably eating extra grams of peanut butter that isn’t being accounted for towards your daily macros. Especially with a food as macro-dense as peanut butter, this could put you well over your macros without you even realizing it! 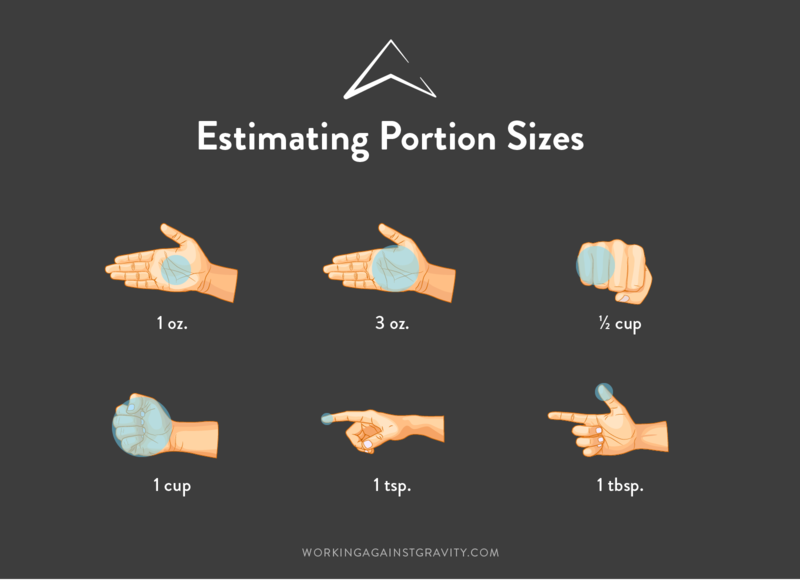 The weight of the food is always going to be more accurate than the cup or spoon measurement. Whether it’s a piece of fruit, a scoop of peanut butter or recipe ingredients, everything has to hit that food scale before hitting your tongue. Which scale is best? Food scales come in all shapes and sizes. Bigger scales are best left in your kitchen while some are small enough to fit in your pocket for counting macros on the go. Need a scale recommendation? Check out our Team WAG Food Scale! 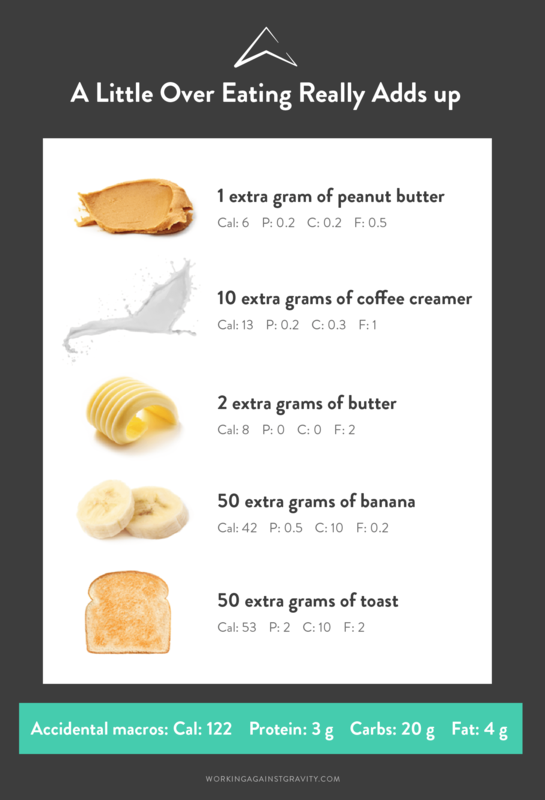 You eat two tablespoons (15 grams each) of peanut butter each day. If you don’t weigh it and are over 10 grams each tablespoon, this adds 20 extra grams of peanut butter. A whole extra tablespoon! If 15 grams = 95 calories, and you eat 25 grams that is 158 calories per tablespoon (or, 63 extra calories). If you do that twice a day you are eating 126 extra calories that day. If you do that for seven days, you have eaten an extra 882 calories that week. Listed serving sizes on packaged foods are helpful when you’re without a scale, but when possible, still weigh and check the accuracy of the label. Often they can be between 1-20 grams off! You may be eating a lot more or less than you thought. The tare/zero button will save your life. Hit ‘Tare’ to subtract the weight of your bowl and after adding ingredients so you don’t have to use separate bowls (or too much math). Should You Track Your Macros Raw, Cooked or Frozen? Weighing your food raw is most accurate because when you cook any food it either absorbs water or water evaporates. For example, 100 grams of uncooked chicken will weigh less than 100 grams once it’s cooked. The weight change will depend on the cooking method and time. For example, chicken that is cooked to perfection will weigh more than overcooked chicken, because it is still holding some moisture. Other examples of foods that will change weights/volume when cooked are rice, oats, frozen fruit and so many more. As you can see, 40 grams of uncooked rice can expand to 114 grams when cooked. 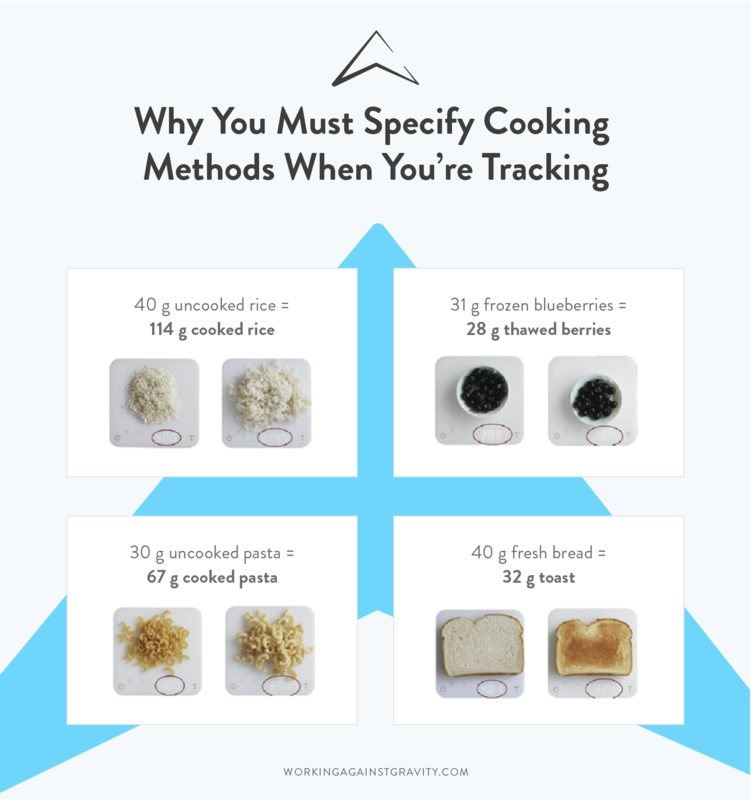 If you track the macros of uncooked rice, but weigh it as cooked, you’re not accounting for all the rice. On the flip side, if you track 100 grams of raw chicken and then measure that chicken out once cooked, you’d be eating more than you accounted for. But, we get it. Sometimes you’re out and about, at a restaurant or friend's house or you forget to measure your food raw...it happens! Now what? The same goes for frozen vs. fresh fruit, grilled veggies vs. raw veggies, and so on. Nutrition information websites like USDA will usually assume raw, so if you’re trying to track cooked food, double check that the entry matches. To weigh small amounts from a jar or container (nuts, seeds, butter, oil, etc) place the whole jar on the scale, press ‘tare’ and then remove the serving you want. The scale will show your serving as a negative (-) number. Practice guessing the weights of your food before putting them on the scale to get better at estimating and build confidence when you’re without your scale. Weigh your vegetables before chopping them, it’s easier and mess-free. Does all of this feel a little overwhelming? We understand! Fortunately, your WAG coach can help you navigate all of it! Let’s get started! When people hear “meal prep,” they think of 1,000 Tupperware containers on their counter and 1200 lbs of chicken in their oven (okay, exaggerating, but you get it). It doesn't have to look that way! If you want to cook all your meals for the week at once, that totally works. “Meal prep” just means taking a bit of time now to make food choices and decisions later easier and more convenient. Measuring out snacks in Ziploc bags. Marinating meat ahead of time. Freezing vegetables to throw in a pan or into the oven. Making one side dish for the week. Finding a healthy restaurant near your workplace with a go-to macro friendly meal. Doubling recipes so that you have enough food for the week. Need some recipe inspiration? Check out our blog for more go-to favorites. See? Meal prep can literally mean anything you do to set your future self up for success. There is no right or wrong way to do it! You have ten minutes to jump out of bed, brush your teeth, let the dog out, grab your coffee and figure out what you’re going to eat for lunch today. Do you make a quick salad? Is there such a thing as a quick salad? Eating properly can be hard. Let’s face it, it’s so much easier to grab a granola bar and pray that the cafeteria at work has something edible. Meal prep allows you to set your future self up for success by preparing healthy meals, snacks or even just ingredients ahead of time making it easy to grab, track and go. This will allow you to enjoy your meal and the people you’re with all while being confident in your food choices. Have something planned and prepared – even if it’s just for emergencies. You’ll thank yourself when it’s late, you’re hungry and just want to hit the pantry or get take out. When Should You Meal Prep? It depends on your schedule. Do you have the most free time on Sunday? Then, Sunday it is! Maybe there are two days a week you can find time to meal prep in smaller batches or just pre-chop vegetables or cook meat. The simple answer is you should meal prep on whichever day or at whatever time you can commit to. This will increase the likelihood that you actually DO it. Some people love to cook and prepare food but many don’t. Listen to a podcast, audiotape or throw a show on in the background to keep you from becoming bored and uninterested. Always have a shopping list, particularly if you’re new to meal prepping. You will forget things. Our WAG Grocery Planner sticks right to your fridge and helps you break your groceries down into macro groups! Plan ahead of schedule. Do you have a lunch meetings or travel this week? How many times this week can you commit to meal prepping? You can meal prep for your meal prep! If you have one day that you can dedicate to cutting a bunch of veggies and marinating your meat for the week, all you have to do is throw it in a pan.grab and go. Look for ingredient overlaps. Eating rice with your beef and broccoli on Monday? Cook enough and use it for your favorite chicken curry dish on Thursday as well. Mix it up! If you’re the kind of person who hates the idea of eating similar things all week keep, the base of your meal the same and add different sauces and spices. In general, glass keeps food fresher and stores better than plastic. So, opt for mason jars or other glass Tupperware when possible. Prepping once a week: Include some meals you can throw in the freezer so they are always ready and don’t go bad! Handy for those occasions where you don’t manage to prep at all. Allocate more time to your meal prep because you will likely be making more meals than if you were meal prepping multiple times a week. Prepping through the week:Food will stay especially fresh if you meal prep more frequently. You can also allocate less time because you're cooking less food. For specific tips on keeping your meal prep as fresh as possible, check out our blog post How To Prep Fresher Tasting Meals! Freezing muffins/cakes also cuts back on snacking because you have to plan ahead before eating them! Enjoying time at a restaurant with friends and family is important to most of us and incorporating it into a successful day of hitting your macros is totally possible with practice and planning. Remember, the goal of counting your macros is to create healthy, sustainable relationships with food. If we told you that you could never eat out again you’d be out the door in a second and we wouldn’t blame you! Measuring, tracking and estimating while you’re out can be nerve-racking but gets easier as you go. Throwing your macro plan out the window leads many people to a "well if I'm not perfect, I may as well eat anything" mindset. You will be shocked by how accurate you can be by estimating! Here are a few things to think about when eating out. To weigh or not to weigh: If you are comfortable whipping out your food scale at the dinner table, go for it! Again, it comes down to your specific goals and how they line up with your personal needs. Refer back to your goals and the flexibility they allow and decide where you stand! Do you need to be strict or do you have wiggle room? Start with an educated guess: Estimate what the portion sizes will be and log them into your MFP diary straight away. Make sure to leave some wiggle room in your macros so you can edit it if needed when your meal arrives. Pick smart: Choose leaner protein sources and lower carb sources like chicken, white fish, tuna, lean red meat cuts, vegetables and fruit. This way if you are off on the estimations it won’t put your macros too far over or under compared to something very macro dense like bread, pasta, rice, cheese and red meat. This can make a difference. If you do want to eat something more macro dense (fattier cuts of meat or desserts) this could be a good time to commit to bringing and using a food scale so you can be more exact in your measurements. Reference your tracker: If you’re eating out at a chain restaurant, MyFitnessPal has an extensive database that has almost anything and everything in there if you just search for it! You can search the name of the restaurant or a specific meal at that restaurant. If you cannot find it that way use something similar. For example, the Chipotle Nutrition Calculator can be used when you’re at a Mexican restaurant. We also have an extensive list of Macro-Friendly Menu Items at popular chain restaurants! Be honest with yourself: If you couldn’t make a double bacon cheeseburger with fries fit into your macros before, let’s be honest...you can’t make it fit now. In other words, stay away from foods that you know don’t fit your macros. Ask if you can sub your fries for vegetables. Ask for the dressing on the side! There are so many ways to create your own meal at a restaurant. MOST IMPORTANTLY: HAVE FUN! Planning and tracking ahead of time is the key to being present in your environment. Head into dinner with the intention of enjoying the atmosphere and focusing on where you are and the company you’re with. Don’t be afraid to give the restaurant a call ahead of time if you have any specific questions about a dish on the menu (like how foods are cooked or what substitutions are available). Double check your macros on calorieking.com if you’re unsure of how to track a dish at a restaurant or need to verify a food entry that doesn’t have a nutrition label. Get a few of your favorite restaurant meals to-go the first time so you can break it down, weigh it at home and save that meal to use in the future for when you go out with friends! Ask if your meal can be cooked using cooking spray instead of oil. 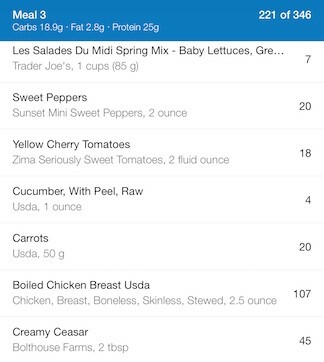 Log it as a meal in MyFitnessPal so you can order it again next time you go to that restaurant! Then you won’t have to do any work!